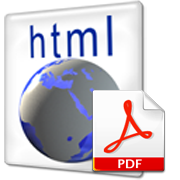 The conversion of webpages to PDF by the tool is done using Apple's Webkit open source render. wkhtmltopdf is something very useful for web developers, as some webpages has a requirement to produce dynamically pdfs from a remote website locations. wkhtmltopdf is shipped with Debian Squeeze 6 and latest Ubuntu Linux versions and still not entered in Fedora and CentOS repositories. Using the static version of the tool is also the only option for anyone on Fedora or any other RPM based Linux distro.